Give a cheers to your favorite craft beer-lover with a refreshing ale poured into this set of gleaming, personalized brewing pint glasses. Thoughtful and thoroughly impressive, these personalized tavern-style pint glasses are the perfect way to enjoy their favorite beverage. Four (4) Personalized Original Great Brew Pint Glasses. Gift is securely packaged to safeguard the shipping process. A free card with your personal message is included with your gift. Free Personalization! One line up to 12 characters. Enter information to be engraved during the checkout phase of the ordering process. Measures 8" x 8" x 8". if ordered by 1:00 pm EDT Monday April 22nd. The Original Great Brew Personalized Pint Glasses is a hand delivered gift. These gifts are delivered by one of our local design centers located throughout the United States and Canada. Same day delivery is available for most gifts when ordered before the cutoff time. The cutoff time for The Original Great Brew Personalized Pint Glasses is 2 PM in the recipient's time zone. 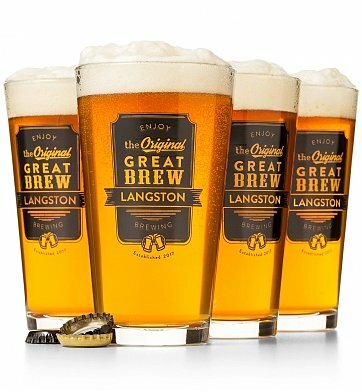 Four Original Great Brew personalized pint glasses. Thick-walled pint glasses, made in the USA.